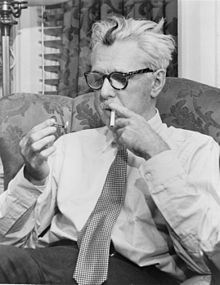 James Grover Thurber (8 December 1894 – 2 November 1961) was an American humorist and cartoonist. All right, have it your way — you heard a seal bark! Cartoon caption, The New Yorker (30 January 1932); "Women and Men", The Seal in the Bedroom and Other Predicaments (1932); also used in "The Lady on the Bookcase", Alarms and Diversions (1957). Le coeur a ses raisons, Mrs. Bence, que la raison ne connait pas. I love the idea of there being two sexes, don't you? Cartoon caption, The New Yorker (4 November 1939). Parody of "I don't know much about art, but I know what I like." Variant: He knew all about art, but he didn't know what you like. It's a naïve domestic Burgundy without any breeding, but I think you'll be amused by its presumption. Cartoon caption (1944), in which a dinner host is speaking to his guests about the wine, reproduced in The Thurber Carnival (1945). "The Shrike and the Chipmunks", The New Yorker (18 February 1939); Fables for Our Time & Famous Poems Illustrated (1940). Because it is derived from Benjamin Franklin's famous saying this is often misquoted as: Early to rise and early to bed makes a man healthy, wealthy, and dead. "The Owl who was God", The New Yorker (29 April 1939); Fables for Our Time & Famous Poems Illustrated (1940). Parody of "You can fool all the people some of the time and some of the people all of the time, but you cannot fool all the people all the time." "The Glass in the Field", The New Yorker (31 October 1939); Fables for Our Time & Famous Poems Illustrated (1940). This is the moral of a fable in which several birds reject a Goldfinch's report that he ran into "crystallized air" while flying across a field, where workmen had left a large plate of glass upright. The Swallow rejects the offer to come along with others and prove the Goldfinch wrong. "The Sheep in Wolf's Clothing", The New Yorker (29 April 1939); Fables for Our Time & Famous Poems Illustrated (1940). The moral is ironic with respect to the fable, in which sheep do insufficient research before writing about wolves, resulting in the sheep being easy prey. "The Courtship of Arthur and Al", The New Yorker (26 August 1939); Fables for Our Time & Famous Poems Illustrated (1940). Parody of Alfred Lord Tennyson's "Better to have loved and lost/than never to have loved at all." "The Grizzly and the Gadgets", The New Yorker (date unknown); Further Fables for Our Time (1956); This statement is derived from one of Henry David Thoreau: "The mass of men lead lives of quiet desperation." A word to the wise is not sufficient if it doesn't make any sense. "The Crow and the Scarecrow", The New Yorker (date unknown); Further Fables for Our Time (1956). This is derived from Oscar Wilde's statement "All men kill the thing they love..."
Moral: Where most of us end up there is no knowing, but the hellbent get where they are going. The pounding of the cylinders increased: ta-pocketa-pocketa-pocketa-pocketa-pocketa. "Who are you?" the minstrel asked. "I am the Golux," said the Golux, proudly, "the only Golux in the world, and not a mere Device." Boys are perhaps beyond the range of anybody's sure understanding, at least when they are between the ages of eighteen months and ninety years. "The Darlings at the Top of the Stairs", Lanterns & Lances (1961); previously appeared in The Queen and in Harper's Magazine. A pinch of probability is worth a pound of perhaps. note for "a future fable", "Such a Phrase as Drifts Through Dreams", Holiday Magazine; reprinted in Lanterns & Lances (1961). Now I am not a cat man, but a dog man, and all felines can tell this at a glance — a sharp, vindictive glance. "My Senegalese Birds and Siamese Cats", Holiday Magazine; reprinted in Lanterns & Lances (1961). "The Trouble with Man is Man", The New Yorker; reprinted in Lanterns & Lances (1961). "The Duchess and the Bugs", 'Lanterns & Lances (1961). The piece was "a response" to an award Thurber received from the Ohioana Library Association in 1953. "The Duchess and the Bugs", 'Lanterns & Lances (1961). Somebody has said that woman's place is in the wrong. That's fine. What the wrong needs is a woman's presence and a woman's touch. She is far better equipped than men to set it right. If I have sometimes seemed to make fun of Woman, I assure you it has only been for the purpose of egging her on. Humor and pathos, tears and laughter are, in the highest expression of human character and achievement, inseparable. In order to be eligible to play it was necessary for him to keep up in his studies, a very difficult matter, for while he was not dumber than an ox he was not any smarter. My Life And Hard Times, referring to a fellow Ohio State student and football star. I am not a dog lover. A dog lover to me means a dog that is in love with another dog. Variant: From one casual of mine he picked this sentence. “After dinner, the men moved into the living room.” I explained to the professor that this was Ross’s way of giving the men time to push back their chairs and stand up. There must, as we know, be a comma after every move, made by men, on this earth. said of the Kennedy-Nixon TV debates in an unpublished manuscript, (dated 20 March 1961); Collecting Himself (1989). “The Book-End,” Columbus Dispatch (1923) Collecting Himself (1989). With 60 staring me in the face, I have developed inflammation of the sentence structure and a definite hardening of the paragraphs. New York Times Magazine (7 December 1958). When all things are equal, translucence in writing is more effective than transparency, just as glow is more revealing than glare. Editing should be, especially in the case of old writers, a counseling rather than a collaborating task. The tendency of the writer-editor to collaborate is natural, but he should say to himself, "How can I help this writer to say it better in his own style?" and avoid "How can I show him how I would write it, if it were my piece?" Quoted in New York Times (21 February 1960). My drawings have been described as pre-intentionalist, meaning that they were finished before the ideas for them had occurred to me. I shall not argue the point. Interview, Life Magazine (New York, March 14, 1960). I’m 65 and I guess that puts me in with the geriatrics. But if there were fifteen months in every year, I’d only be 48. That’s the trouble with us. We number everything. Take women, for example. I think they deserve to have more than twelve years between the ages of 28 and 40. One (martini) is all right, two is too many, three is not enough. My opposition lies in the fact that offhand answers have little value or grace of expression, and that such oral give and take helps to perpetuate the decline of the English language. Quoted in The Observer (London, 5 February 1961).